This scrumptious cheesecake, baked in a graham crumb crust, is flavoured with coffee and drizzled with melted chocolate and a coffee-caramel sauce. Cheesecake has never tasted so good! Add hot water to 2 Tbsp. coffee mix; stir until dissolved. Cool. Meanwhile, mix graham crumbs, cinnamon and butter; press onto bottom and up side of 9-inch pie plate. Beat cream cheese and sugar in large bowl with mixer until blended. Add eggs and coffee; mix just until blended. Pour into crust. Bake 35 to 40 min. or until centre is almost set. Cool completely. Refrigerate 3 hours. Melt chocolate as directed on package; drizzle over pie. Mix caramel syrup and remaining coffee mix in saucepan; cook and stir on low heat until heated through. Cool to room temperature. Serve drizzled over pie. Prepare using Maxwell House Café, Suisse Mocha Instant Coffee Beverage Mix. 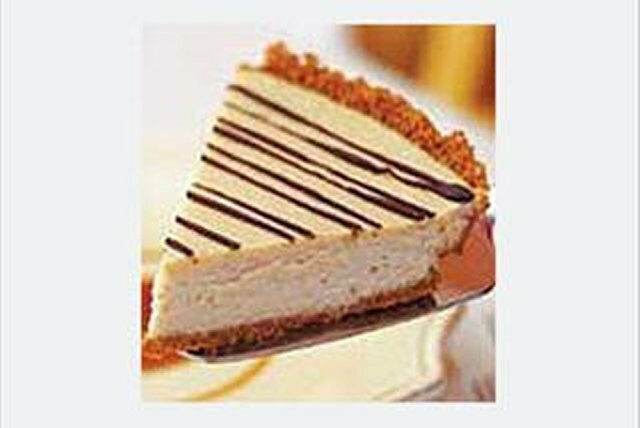 This luscious cheesecake can be refrigerated up to 5 days before serving. Since this ultra-indulgent cheesecake makes 12 servings, it's the perfect dessert to serve at your next party.